Get your “Tiny Nation” tee-shirts, tea cozies and other tchotchkes here! 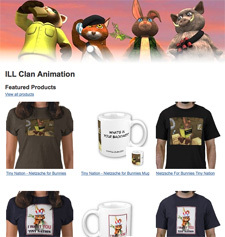 Fans of the machinima series "Tiny Nation" will be happy to know that you can now purchase all sorts of "Tiny Nation"-branded clothing and merchandise from Ill Clan Studios. For those that haven't seen the show, it's the story of a cute but profane group of backyard animals who stage various unsuccessful rebellions against their human oppressors. Head here for the Tiny Nation online store. For some reason they don't sell a flask, bandolier or beret, but maybe that's coming later. Can action figures be far behind?